Nautical charm in Carmel-by-the-Sea. Walk to downtown and beach. Contact us for different dates. 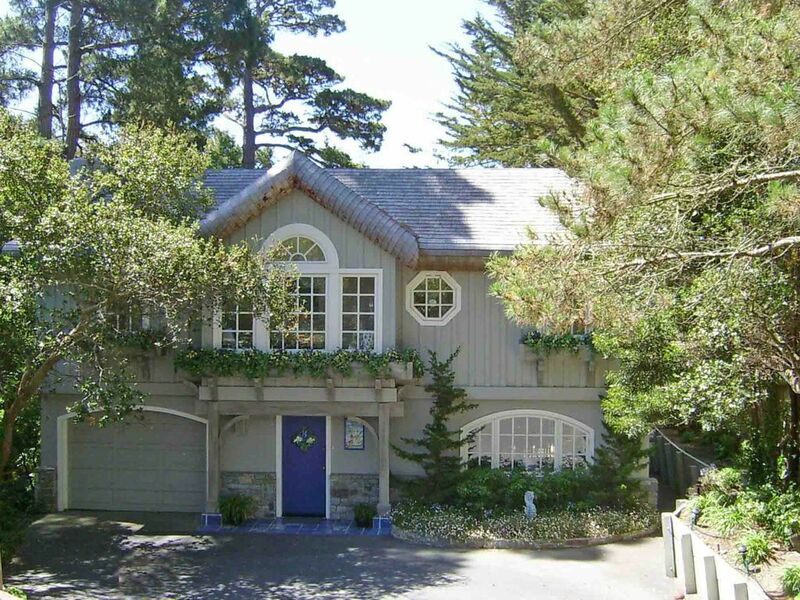 Out of the Blue' is a charming two bedroom/two bath cottage at the gateway to beautiful Carmel-by-the-Sea. The unique nautical theme throughout Out of the Blue introduces you to authentic Carmel. You will enjoy the benefits of the Carmel lifestyle including walking to the town and white sand beaches, the Forest Theatre and wonderful restaurants. Graced with beautiful large windows and abundant flowers cascading from window boxes, this home is a true Carmel beauty. Diane has put her unique decorator touch on the whole house beginning with the front entry. A handmade Dutch door created with stained glass greets each guest. Sea life mosaic stepping stones are embedded in the beautiful blue entry tile. A large mosaic on the wall welcomes you.Blue carpet leads to the upper level where you will be delighted with the many windows, bright sunshine, and distant ocean view through the Monterey pines. The spacious upper level, decorated with whitewashed wicker, is warm and inviting in wonderful colors of blue, turquoise, jade and white. The hardwood floors throughout add to the beauty and warmth There is a gas-burning stone fireplace to keep you cozy on cool nights. The entertainment center features an HDTV with streaming Internet, including Netflix. The dining table seats six and has a filtered view of lacy redwoods with the Pacific and Point Lobos in the distance. The newly remodeled kitchen features two more of Diane's beautiful mosaics that complement the handmade blue tile counter tops in the kitchen. The window seat forms an inviting nook for reading and relaxing. There is a large deck overflowing with flowers on the top level with seating and a small table for beverages or snacks. The upper bedroom is unique with a turquoise wrought iron bed frame in the form of a seashell. All of the furniture was custom made for the room and is adorned with turquoise seashell handles and legs. Beautiful bedding and nautical stained-glass lamps as well as original water colors and a streaming HDTV complete the room. The lower bedroom is decorated in blue and white with white wicker furniture and a king-size bed. A cozy corner fireplace with unique mosaic design by local artists adds warmth and charm to this beautiful master suite. There is a streaming HDTV for your enjoyment. The large, tiled bathroom is airy and bright. 'Out of the Blue' has a lovely enclosed backyard with used brick patio and lush plants. There is a small table, chairs and a chiminea on the patio for relaxing and a dining table for outdoor entertaining, along with a gas barbecue. Five short blocks finds you in the heart of town with Carmel's quaint shops, beautiful art galleries, and excellent restaurants. Carmel beach is only a ten-minute walk from the house. It is a great way to get exercise and have fun too! Forest Theatre is just around the corner, and Mission Trails Park (great hiking) is five minutes away. Come and experience the charm of 'Out of the Blue! Our romance began in 1961 when Diane came to Carmel at age 22 to be a 4th grade teacher at Carmel River School. Out of the Blue, she met Chuck who had just left the Navy's Blue Angels and was enrolled in the Naval Postgraduate School. In 1964 we were married and began a life together. Through the years, as a Navy family, we lived many places, but always returned to Carmel to visit our old friends and to bask in the beauty of the area. Three HDTV's with DVRS & streaming Internet access, including Netflix. Deck with ocean view on upper level. Patio with barbecue, chiminea, swing and dining table on lower level. Wireless high speed Internet, streaming Netflix, two fireplaces, deck with filtered ocean view, patio, beach gear, DVDs for adults and kids. Hike the magnificent trails of Point Lobos State Park. Drive the Spectacular coast highway south to the redwoods of Big Sur. Experience the stunning view from Nepenthe Restaurant. Enjoy the sunset from the incomparable Highlands Inn. Walk the world famous Carmel beach. Stroll through downtown Carmel-by-the-Sea. Enjoy the unparalleled art galleries, shopping and restaurants. Cruise the beautiful 17-mile drive through the Del Monte Forest. Immerse yourself in the Monterey Bay Aquarium. Visit the Steinbeck Museum in Salinas. Golf the many gorgeous courses of the Monterey Peninsula. Enjoy one of the special events held throughout the year.